I found this hilarious when I was reading this book. Pearls are primary made of Calcium Carbonate (CaCO3) and conchiolin. And the interesting fact is that certain mollusks form a pearl sac to protect themselves from a potentially threatening irritant such as a parasite inside its shell, or an attack from outside, injuring the mantle tissue. It uses the pearl sac to seal off the irritation. 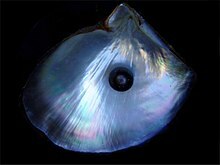 A black pearl and a shell of the black-lipped pearl oyster. The iridescent colors originate from nacre layers. Furthermore, its diamonds that are formed by subjecting coals to extremely high pressures. In fact, for manufacturing of artificial diamonds, carbon beads are subject to pressures as high as 5 GPa at 1500 °C. This process is also called the HPHT method. So now you know better!! !